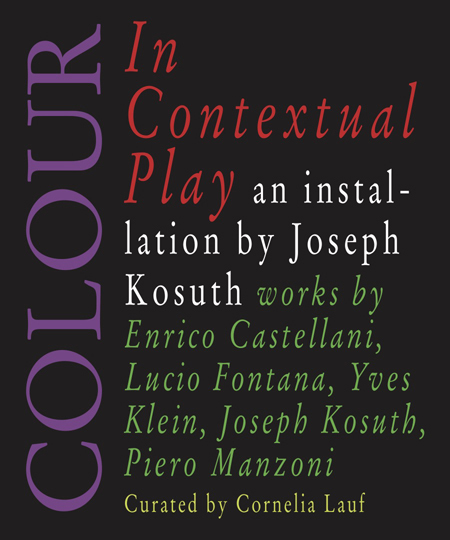 Mazzoleni London is pleased to announce Colour in Contextual Play, an installation by American conceptual artist Joseph Kosuth (b. 1945). Part of a series in which Kosuth installs contemporaries or forebears, the exhibition will incorporate a selection of work by artists proposed by influential Arte Povera artist Emilio Prini (1943–2016), namely Enrico Castellani (b. 1930), Lucio Fontana (1899–68), Yves Klein (1928–63), Kosuth himself and Piero Manzoni (1933–63). The exhibition is curated by Dr. Cornelia Lauf, an art historian based in Rome and Sicily. The exhibition will juxtapose monochrome works by Castellani, Fontana, Klein and Manzoni with works from Kosuth’s 1968 series “Art as Idea as Idea.” This series made a conceptual investigation into the relationship between words, ideas and objects. It comprised photographs of dictionary definitions of words including “meaning” and “idea.” For Colour in Contextual Play Kosuth will create a site-specific installation produced especially for Mazzoleni that places the examples “white,” “black,” “grey,” “red,” “green,” “yellow” and “violet” in company with works by the other artists utilising those colours. Colour, or its absence, is a theoretical as well as an aesthetic consideration in all the works displayed. The artists share an uncompromising analysis of conceptual structures that interrogate the nature of space, colour, form and time. From raised canvases punctuated by nail points (Castellani), to an indigo so profound it received its own Pantone number (Klein), explorations of the space beyond colour (Fontana) and natural colour that was also a non- colour (Manzoni), each artist explored the nature of vision in depth over the course of their careers. The installation will call to mind other cross-historical exhibitions by Kosuth, including The Play of the Unmentionable at the Brooklyn Museum (1990) and The Play of the Unsayable: Ludwig Wittgenstein and the Art of the 20th Century at the Vienna Secession and the Palais des Beaux Arts, Brussels (1990), as well as installations of Magritte, Ad Reinhardt and others. The personal relationships among the artists are an additional sub-text to the exhibition. It is the nature of artistic inspiration, and the close observation of the work of friends and mentors, that is the curator’s fundamental subject of study. The spiral-shaped or Greek meander patterns in the making process are ones that greatly fascinated Prini and witnessing this process first-hand inspired Lauf to propose this highly personal, yet simultaneously art historical, project. The exhibition will be accompanied by a publication designed by Joseph Kosuth and published by Nero. It will include an essay by Cornelia Lauf and an interview with Joseph Kosuth.